Shaun opens his door and sees that Kenny left him a bottle of milk with a note thanking him for being there for him. Drs. Andrews, Park, and Murphy meet with a patient named Gretchen who cannot smile. She has paralysis in her face. They will take muscle, nerves, and blood supply from her thighs to implant them in her cheeks to make her smile. She makes a few jokes but is frustrated that no one can understand her jokes without her having facial expressions. Shaun asks if she wants to be a comedian because people getting her jokes must be important to her if she's willing to risk her life for the elective surgery. Dr. Andrews apologizes to Gretchen's dad for Shaun's comments. Her dad says it's more than just a smile. She can't show any emotion and no one can tell if she's happy, sad, or scared. Drs. Melendez, Browne, and Reznick work on a patient named Lucy who has a post-operation infection. She hasn't been taking her antibiotics because she didn't think they were necessary. Shaun runs into Glassman in the hospital coffee shop. He tries to walk away so he won't have to talk to him, but Glassman stops him to talk. He offers to buy Shaun his apple, but Shaun refuses because Glassman didn't want to be friends. Shaun says he has a new friend. Shaun says the barista, Debbie, was flirting with Glassman. Shaun says she exhibited two signs of flirting and gave her an extra dollar in change. Shaun meets with Gretchen. She says they call her "the Resting Gretch face." She says she wants to be more approachable, but Shaun says he doesn't want to be more approachable or have people read his emotions. She asks if he really thinks the surgery is too risky. Shaun tells her the risks of the surgery. Reznick and Claire discuss their patient. Reznick tells Claire that her mom died when she was 6. They go to the patient's bed but she is not there. Dr. Andrews walks in to Gretchen's room with her dad. Gretchen tells them she's changed her mind. She doesn't want the surgery. Andrews goes to Murphy to tell him that Gretchen's dad is upset because he talked her out of the surgery. He says he just gave her the list of possible complications. Shaun says smiles are overvalued. Andrews says that when people smile, they produce endorphins and make humans happy. He says smiles are contagious. Shaun says he doesn't like smiles. Andrews tells him to get Park and come with them. Kalu goes into a patient's room and sees Celeste, the woman that was burned earlier in the season. She was also known as "fish girl." He asks how she's doing. She says she's been wearing the Tilapia skins for 5 months and doesn't have pain anymore. She asks Jared how much longer she needs to wear it. Kalu tells her he can take it off tomorrow. She is thrilled but also nervous about how she will look. Andrews tells Gretchen it is a fairly risk-free surgery and tries to talk Gretchen into doing the surgery. She says Shaun didn't talk her out of it but inspired her. She learned that this could make her stronger and that she doesn't want to run from it anymore. Park says she is lying. She isn't someone prone to inspirational stories. He says when he was a cop, people changed their mind about testifying in court because they were either confused, scared, or paid off. Shaun asks if Gretchen was "paid off." Park says the analogy isn't perfect, but he seems to think she doesn't want it for money purposes. Andrews agrees and walks away determinedly. Claire meets Reznick in the hall to tell her that their patient Lucy is back in the ER. Reznick accuses her of calling her to bring her back. Andrews tells Gretchen the surgery is medically necessary in his opinion. Her dad says his first memory of her mother is of her smile, which is how they ended up with her and his last memory of her is of her smiling. She says she loves her dad but won't let him risk everything he has, including all of his money, for the surgery. Reznick and Claire go to get Lucy from the ER waiting room. An older woman walks toward them with a cane. Claire and Morgan are confused. The woman says Dr. Browne called her to tell her to pick up her prescriptions. They take Lucy back to a curtain and tell her that she had her identity stolen for medical fraud. The other "Lucy" had filled this woman's prescription for pain meds. The pharmacy wouldn't give the real Lucy her pain meds because they thought she was using drugs. Lucy is in a lot of pain. Reznick tells her not to worry and that they will get her the meds somehow. Andrews meets an insurer who denied Gretchen coverage for the surgery. He argues with the insurer and says he will put this conversation on her permanent record in case something does happen to her. Shaun walks into Glassman's room with a big smile on his face to test Andrews' hypothesis that smiles are contagious. Glassman gives him a small, fake smile back, and Shaun tells him it wasn't a real smile. Shaun says he wants to do something and asks Glassman to follow him. Melendez says they need to treat the real Lucy and comb through the charts to determine whose medical records are whose. He says they need to treat the real Lucy but they need to be clever about it. Glassman asks Shaun what he is doing. Shaun takes him to the coffeeshop and asks Debbie if she flirted with Glassman. Glassman is embarrassed. Shaun says he has a new friend so Glassman needs one too. He then tells Glassman that her facial proportions are close to optimal so he should find her attractive. He also says he thinks they're both Jewish, which is helpful for social bonding. Andrews tells Gretchen that the insurance company will pay about 85% of the cost of the surgery. Her dad says he can easily cover the rest of the cost. Reznick gives Lucy a pill bottle with the name "Jane Doe" on it so that they can give treat her. Claire and Reznick get a notification that the imposter Lucy is coming to the ER in an ambulance. Claire and Reznick take care of the fake Lucy, who is in septic shock. Claire and Reznick go to Glassman's office. Reznick thinks they should report her, but Claire says they shouldn't because she is really sick and their job is to treat her. Claire says that people wouldn't get help if they thought they would be arrested. Glassman says he does not want to be sued by either woman. He tells them that as soon as fake Lucy is stabilized, they will press charges against her. Andrews and his team work on Gretchen's surgery. Kalu talks to Celeste who says she doesn't want anything for the pain. He begins removing the tilapia skins and talking with her. Claire tells imposter Lucy that she isn't responding to the antibiotics. Lucy asks if she knows. Claire tells her they do know that she isn't the real Lucy. She says she had to choose between college tuition for her son or health premiums for herself. Claire says she could have gotten the antibiotics when she got the pain meds. The fake Lucy says she didn't get any pain meds or antibiotics. Kalu continues to help Celeste. He gets all of the fish skins off of her. He tells her to look in the mirror. She is nervous but happy when she finally does look. Kalu says she is beautiful. Claire does research and finds out that the real Lucy was denied pain meds because she actually is an addict. Shaun walks into Gretchen's room. He says it's been too long and that she should be breathing on her own by now. Shaun takes her respirator off and Gretchen cannot breathe on her own. He puts it back and then goes to find Dr. Andrews. Shaun walks with Andrews and Park to figure out what is wrong with Gretchen. They can't figure out what is wrong with her. Shaun asks Andrews if he feels bad for telling them the surgery was close to risk-free. Andrews doesn't answer him but orders him to get a CT and rule out a variety of things, including a stroke. Septic protocol isn't working on the fake Lucy. Melendez tells them to continue to help her and that he knows it's coming out of the hospital's own pocket. Glassman and Debbie have their "date" in the hospital coffee shop. It is awkward. Glassman tells her that he is only half-Jewish and Debbie says she isn't Jewish at all. Her first husband was Jewish. When they are about to leave their date, an old Mercedes car crashes outside the hospital. Debbie is sad that a perfect car just got a little less perfect. Glassman and Debbie start talking about classic cars they love. She asks if he wants another coffee. Shaun goes to Jared and smiles at him. Jared says it's unsettling. Jared is looking up information and tells Shaun that he is dealing with a personal situation. Shaun says he is a person and can help Jared. He asks Shaun what he should do about his burn patient who he likes and who he thinks like him. He is worried that it is just transference of her gratefulness. He says he's only known unrequited love and it makes him vulnerable. Shaun tells him to call in sick because that is what Lea says you need to gain superior wisdom. 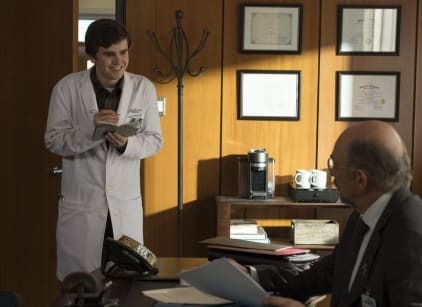 Park, Andrews, and Murphy meet with Gretchen's dad. Her CT was normal. They tell him it could be a brain injury as a result of anesthesia. They believe she is brain dead. Gretchen's dad stands outside her room and looks at her while crying. He is worried that he made her think she wasn't good enough the way she was. He tells Shaun that he should have listened to him. Park walks away from the group. Andrews yells at him for walking away. Park is looking at the computer. He thinks she may still be under anesthesia and could have a deficiency that keeps her from breaking down the drug, which is rare. Andrews tells him not to tell her father because he doesn't want him to grieve twice if they are wrong. Claire tells the fake Lucy that she is running out of time and her organs are shutting down. She wants to know what her real name is. She is on a vent, but she writes her real name, Beatrice, on a piece of paper for Claire. Parks and Murphy work on Gretchen while her dad sleeps. He wakes up as they try to do a corneal reflex. She jumps, which means she is not brain dead. The dad hugs Park and goes to hug Shaun, but Shaun backs away. Gretchen is going to be fine. The real Lucy comes into the ER and tells Morgan that she dropped her pills in the bath and that it ruined her pills. She needs more pain meds. Reznick says they know about her addiction and offers to help her. Gretchen is awake now, and they put neuro stimulators on her face so she can smile and see what she will look like in three months. She smiles and her dad says it's her mother's smile. Everyone around her starts to genuinely smile. Allegra tells Andrews that she is impressed with his work on Gretchen. She tells him it was presidential of him. He tells her he nearly ended her life. Jared meets again with Celeste and introduces Shaun to her. Shaun will be taking over her care from now on. Jared tells her that doctors aren't allowed to date their patients. He says he's calling in sick tomorrow and asks her what she is doing. Claire tells Reznick that the upside to all of the Lucy mess was that the real Lucy was able to get into rehab. Claire tells her it was nice of her to take care of her. Claire lets her know that she knows Morgan was lying about her background and that her parents are doctors and have been happily married for 37 years. Reznick says coming from privilege means they get no respect. Claire sarcastically tells her it must be so hard to overcome. The fake Lucy flatlines and dies. Reznick leaves the room quickly because she is clearly upset. Jared sits in the locker room and opens an acceptance letter for a residency in Denver. Shaun takes pizza to Kenny's. He has other friends over and tells Shaun that he will have to take a rain check on the pizza night. Shaun notices that they have the same TV. Kenny says he borrowed Shaun's because it didn't make sense for them both to have one. Shaun tries to go into his apartment, but Kenny stops him and says he has a few quirks that won't jive with the group in his apartment. Kenny takes the pizza from Shaun and closes the door on him. Glassman and Debbie are at a restaurant on a real date. They are still talking about classic cars that they love. Glassman asks her if she wants to go to a car show with him. He goes to ask for the check but instead says "We'll take the doorstop." He can't get the word check out. He keeps calling it a doorstop. He tells Debbie and the waitress to call an ambulance. Glassman starts crying. What would happen if people who needed our help thought they would be arrested? Permalink: What would happen if people who needed our help thought they would be arrested? Do you want to be a comedian? People getting your jokes must be very important to you if you think it’s worth the risk of dying during elective surgery.